Feb 2014 Pinnacle Canyon Condo 16102__ Everything was well stocked. This was wonderful - Thank you! Comfortable, homey, beautiful scenery. Feb to March 2015 Sunset Ridge 729__This was a comfortable spacious unit that was well stocked. We had everything we needed for our stay. Furniture was comfortable and well maintained. The complex was well maintained with 2 heated pools and 2 hot tubs. The rental agency was quick to respond to answer any questions we had. We enjoyed our stay here. Feb to March 2015 Sunset Ridge 729 __This was a comfortable spacious unit that was well stocked. We had everything we needed for our stay. Furniture was comfortable and well maintained. 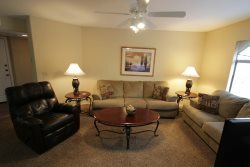 The complex was well maintained with 2 heated pools and 2 hot tubs. The rental agency was quick to respond to answer any questions we had. We enjoyed our stay here. Jan Feb 2014 ___Sunset Ridge 729____ Good location plus comfortable and clean. Good facilities. If possible we will return in 2015! Oct through Nov 2013 _Sunset Ridge 729_Thanks for your help with the modem and support in making this a good experience during a pretty stressful time for us. __Canyon View 8248 __Everything was perfect....! Feb 2015 Canyon View 8248__It is going to be very difficult to leave this beautiful place on Sunday! We've had a lovely stay and want to thank you, belatedly, for your help in getting settled in. Jan 2015 Canyon View 8248 ___Everything was handled very professionally. Feb 2015 Skyline Villa Condo 265 __ Great condo, location and service! The kitchen is generally well equipped. Feb 2014 __Skyline Villas Condo 265___ Corby was very helpful and everything was fine! We anticipate coming back next year. March 2015 Skyline Villas 265 __ The condo is very nice and clean. We love Skyline Villas and have stayed here several times, very easy booking. Agent was very helpful and even suggested some local attractions. Very good experience. Jan 2015 Ventana Vista 17-2162 ___Delivered what the website promised! Very, very well equipped kitchen! March 2014 __Ventana Vista 17-2162__ Beautiful condo, well equipped. December 2013V Ventana Vista 17-2162__ We loved the condo. All the small details made our stay a wonderful one. We love to cook and really did not miss a thing in the kitchen. The decorations was exquisite. We rent a lot of apartments but this one is by far the best. Thanks for having us here. March 2013 _Canyon View 9254_Back for our third visit in this condo. We love the Foothills and staying at Canyon View. Always have a great time and hate to go back to Chicago's winter. Thanks! Feb 2014 Canyon View Condo 9254__ The booking and payments process went smoothly. The place was wonderful and we were very happy with the location and the foothills view. Jan 2015 Canyon View 9254__ Nice closet storage, clean fridge, washer/dryer access was handy, appreciated the dishes, towels and supplies. Overall - comfortable and convenient. March 2014 Canyon View 9254__10's across the board! The condo was adequately furnished. This was a great first experience in renting a condo. Feb 2015 Canyon View 9254 __ Very clean condo. Reservation system and access to a Solterra Rep was great. Kimber was very efficient and took care of any issues we had. All of the information pamphlets on Tucson and the area were a nice touch. April 2015 Canyon View 24204___Excellent service, very clean, all amenities in good status. Kimber, great service - Congrats! _Acacia Guest House Tucson_ I really liked the space, the decor and location. I felt at home! _Acacia Guest House Tucson_This is one of the few (best) places that we enjoyed greatly. We plan to visit your home next year. ___Acacia Guest House Tucson___The accommodations were perfect for our stay and Liz (the host) was extremely helpful. We appreciated her tips on eateries and helping us with printouts of our boarding passes for the flight home. We enjoyed our stay in Tucson. Having the Acacia Guest House as a home base was perfect. 2012 __Acacia Guest House Tucson _What a great house! What a great guest host! It was great to spend a day sightseeing and be able to come "home" to a most comfortable house. It was the most likeable vacation dwelling we've stayed in.